yarrmateys wrote: should this extension demand browser restart to update? i thought that was supposed to go away completely with the advent of webextensions, but this one persistently tells me to restart firefox after each update. Is there anyway you can add support for firefox sync ? Pret1934 wrote: Is there anyway you can add support for firefox sync ? Just recently started using S3, and I have a question. Would it be possible to define unique translations? Meaning tell it that a certain word or phrase should be translated in a different way (or a different word) ? Dirk X wrote: Just recently started using S3, and I have a question. Would it be possible to define unique translations? Meaning tell it that a certain word or phrase should be translated in a different way (or a different word) ? And if what I want isn't there? Can I enter my own word/term and it'll remember it in the settings? I don't see how to do that. Dirk X wrote: Can I enter my own word/term and it'll remember it in the settings? I don't see how to do that. I'm a poor student but I'd definitely contribute (donate) a bit if you could do that. Thank you. Dirk X wrote: I'm a poor student but I'd definitely contribute (donate) a bit if you could do that. Thank you. you do not necessarily to pay. S3.Translator don't collect cookies, password, e-mails or any other confidential info. Only the domains (not full URLs) of the web-sites visited and nothing else. Sorry for the late reply. I will do what you said. Keep up the great work - see ya . Dirk X wrote: Sorry for the late reply. I will do what you said. Keep up the great work - see ya . S3 always wants to translate some sites (for example YouTube). I select Options->Turn off translation for this site, but a short time later, after I click in a few more links, the app tries to translate another page. Brian E Clough wrote: S3 always wants to translate some sites (for example YouTube). I select Options->Turn off translation for this site, but a short time later, after I click in a few more links, the app tries to translate another page. sometimes, when I write some text in an input field, I select a part of my text to translate it with S3.translator and if I have some text in the clipboard, S3.translator translates that text that is memorized, and not the selected text. 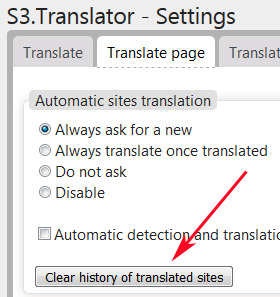 Should I set up S3.translator in another way so that issue does not happen, or is it a kind of bug?